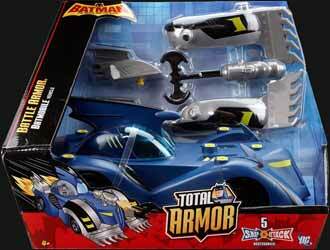 The Battle Armour Batmobile Vehicle is based on the Batmobile design as seen in the Batman: The Brave and the Bold animated series. The vehicle comes equipped with a number of additional parts, so you can play with the Batmobile in normal mode, or attach the additional "battle" elements to turn this into a super destructive car. However, I was a little disappointed to see that while in normal mode, the car looks incomplete. The yellow holes where the weapons are attached make it look rather odd before it is transformed. This is probably to clearly illustrate to small children where all the parts go, but means that when on display it looks better in battle mode. In addition to the add-ons included, you can also attach other weapons that are found on a number of the other Batman figures in the range - which adds to the fun for young collectors. 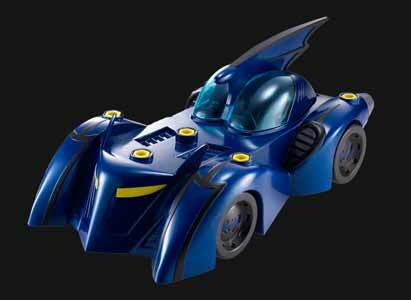 The vehicle can fit most of the series' 5.25"/13cm Batman action figures. However, there isn't a figure included. Overall this is a chunky, sturdy vehicle that looks fantastic.